I’ve been looking for a good shaving cream lately and been very disappointed on my search results. Then I came across a post from both Stephen Davison and Michael Davis members of my Google+ Wet the Face community. They posted a SOTD using C.O. Bigelow shaving cream. I tried just about everything else so why not try this one too. I found the site online and put an ordered in. When the parcel arrived, on the outside the box read 414 Sixth Avenue below ninth street. I had no idea of the address so now I might be able to take a visit to the store when I’m in the city during my lunch break. Everything was carefully packed nestled inside the bubble wrap. My order of one premium shaving cream 5.2oz and two additional samples of Proraso Balm and Marvis Mint Mouth Wash where both free of charge when you order from the website over a certain amount. You have to love the metallic looking box and tube the shaving cream comes in. The only problem I have with the tube is that it’s made of a thin metal or tin and retains the shape of where you squeeze. Some people have no problems with this but this is a pet peeve of mine. I just hate the way the tube looks after many uses. The scent of the cream is eucalyptus and man does it smell great. 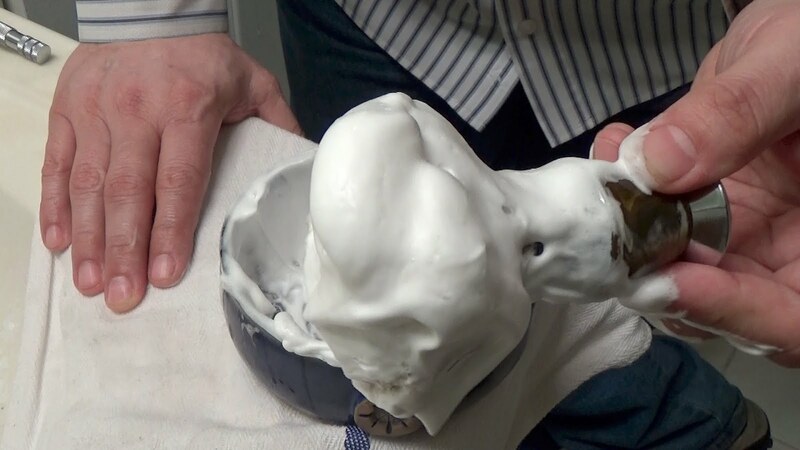 This shaving cream instructions said it allows you to use a brush which is my preferred method and after adding a little water It took only 47 seconds to create an amazing bowl lather. A rich creamy lather which was easy to applied and very thick. It completely covered my face and worked its way into my 6-day old beard with little effort. The eucalyptus kept it interesting I experience a very refreshing feeling during the entire shave. My slant was able to run across my face with ease allowing for multiple passes with no irritation. My post shave feel was one for the books with the eucalyptus still present and working its magic. So, I had a great shave with this cream for now my search is over. I’ll stick with this one until the urge to look again hits me.